Endorsing a brand through content is effective. That being said, it is also important for marketers to know that content writing is not about selling. It focuses more on lead generation and nurturing them further. These pieces written by experts are helpful, as they comprise informative substance, enabling readers to know more about a particular brand or the services it renders. Other than posting content on their respective websites, entrepreneurs make them available on different social media platforms like Facebook, Twitter, and Pinterest. People, who access social media websites to read content, are driven back to the entrepreneur’s website wherein they can spend more time learning about the products put up for sale. While at it, industry experts also recommend updating the website at regular intervals. As per statistics, websites that have static content never see improvement in their traffic levels; after some time, it results in stagnant income. By adding new content to the website, companies can create a positive impact on their individual ranking on different search engines. The more content the visitors share, the more benefits a brand receives. B2B marketers are renowned for using a wide range of strategies to spread a word about their offerings. Among them, article posting stands out, followed by social media, blogs, newsletters, case studies, and in-person events. The purpose of content marketing differs from company to company; where some marketers target brand awareness, others focus on lead generation. 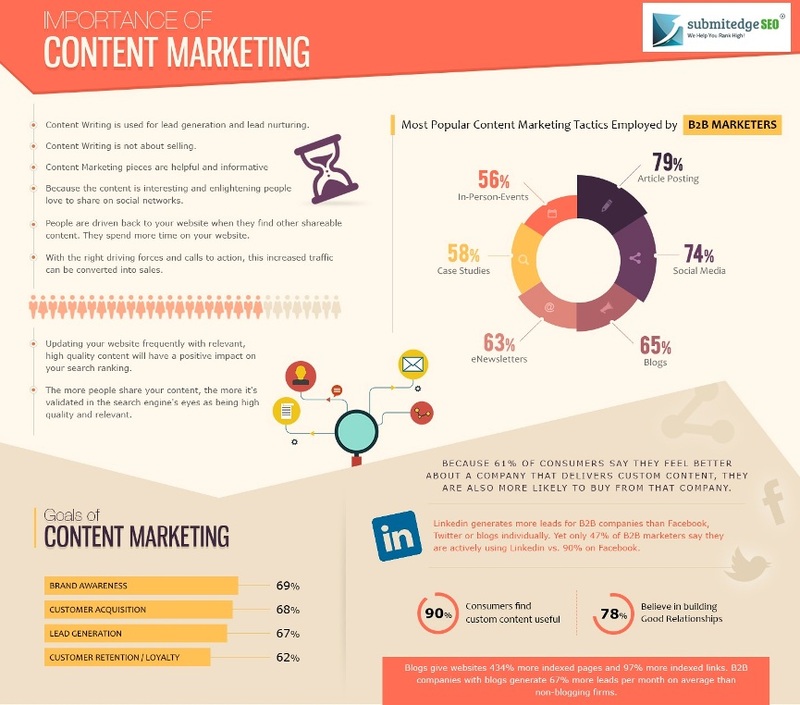 However, these outcomes are an integral part of the concept known as Content Marketing and achieving them can be beneficial in the longer run.